It is just adorable Kimberley! "Hi Michelle, I recently purchased your pattern instructions for your cute little tote. 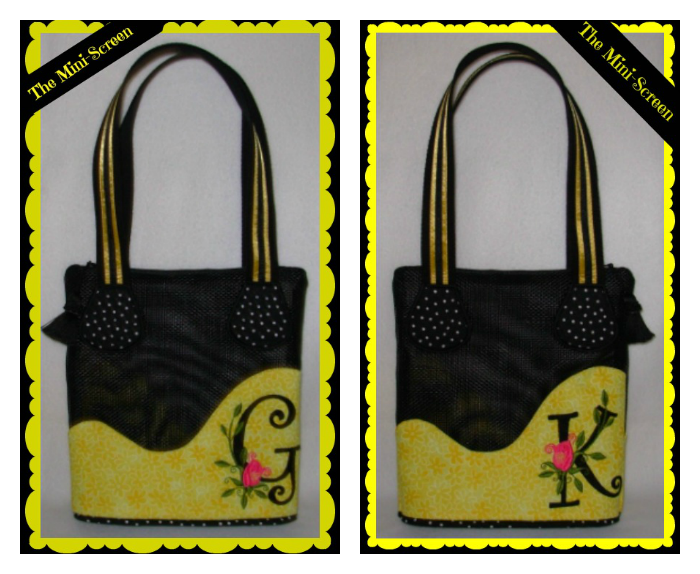 I made this tote featuring Whimsical Roses Monograms by Santi from Hatched in Africa embroidery designs. I want to compliment you on your instructions...they are really nice...love all the pics. Also, I really liked working with the type of screening you suggested. I have never heard of it before, and a few Walmart employees had not either....LOL My husband and I wondered around the store until he spotted it in the hardware isle. This is one tote, you are seeing both sides. I couldn't decide if I wanted to use the K or the G (for my last name)....so I decided to use both. Thanks for creating this little cutie. Kimberley Gavrus." Kimberley, THANK YOU for sharing your adorable creation! If you have made a project using one of my patterns, I would LOVE to see it and share it on my blog. Please send me a picture or two to my email SewMichelle@outlook.com. If you would like to purchase your own Mini-Screen Tote Bag Pattern, please visit my Etsy Store by clicking here or you can purchase through Secrets of Embroidery by clicking here.